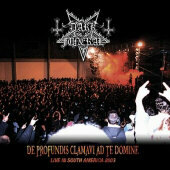 Not much to say about this other than it's a live album of Dark Funeral playing in South America. I guess my interest was mildly piqued because of my passion towards the Southern Cone, but other than the Portugese intro and football/Chile chants that are "different", it sounds like another live album. The shows sound wicked, and remind me of why I used to dig this band, cause they're pretty dang good. Matte Modin sounds like an animal behind the kit, it's incredible. If you happen to have a Dark Funeral collection you need to fill out, or you were at these shows and want to relive those memories, then you may consider purchasing this album. Otherwise you might as well just get the regular albums.